There’s a philosophical theory kicking around the academy that we humans are all characters in a computer program like The Sims. The argument, generally credited to Oxford philosopher Nick Bostrom, is that a highly advanced society will eventually be able to produce a computer simulation that is indistinguishable from reality. The characters in such a simulation will of course eventually create their own simulations, resulting in billions of simulations, sub-simulations, and sub-sub-simulations, all completely real to their inhabitants. Eventually, there will be more simulated people than real people, making the odds that any one person is real rather than simulated vanishingly small. I don’t know if Chicago-based playwright Mickle Maher has heard of this theory, but it strikes me as the kind of thing he’d appreciate. Maher’s new play The Pine, which opened last week at Catastrophic Theatre, is set in a limbo-like zone between life and death where it’s impossible to tell who’s real, who’s a copy of a real person, and who’s a character in somebody else’s story. Of course, that’s a pretty good description of theater itself, an artistic medium in which people pretend to be someone else and we as an audience go along with it. 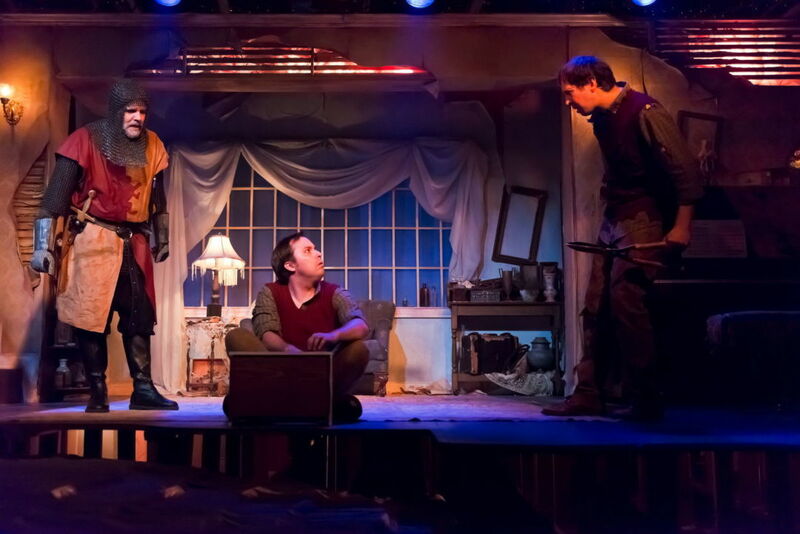 The play begins in a dilapidated old hotel on Lake Michigan called The Pines. 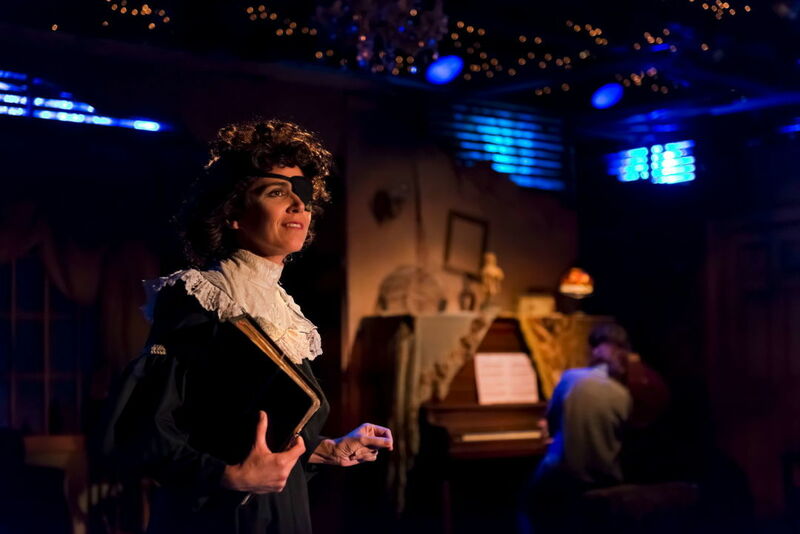 The narrator, a Miss Havisham-esque woman named Clara (played by Amy Bruce), tells the story of the hotel’s manager, a sad sack named Gordon (Troy Schulze), who falls in love with the neighborhood piano teacher, Danelle (Patricia Duran). After a brief love affair, Danelle commits suicide, writing “Betrayed” on her music score. Devastated, Gordon also commits suicide—or at least attempts to. When he wakes up from his pills-induced coma, he finds himself in a Twilight Zone version of the hotel, The Pine, where pining lovers (get it?) live out a kind of purgatorial existence between life and death. The Pine is populated by a motley assortment of characters united in their mourning for something lost. Gordon has lost Danelle; Clara has lost her baby; Morris, an eleventh-century English knight, has lost his cat. Like Jorge Luis Borges’s mythical Library of Babel (Maher fills the play with literary references, from Dante to Emily Dickinson), the Pine consists of infinite rooms, each one containing a mournful shade. Once Gordon arrives at The Pine, the plot becomes a variation on the classic quest narrative—Gordon must search out his beloved Danelle among the endless corridors of the hotel. His search is complicated by the existence of numerous imitation Danelles, known as Deer Hearts, who try to cozen him into believing they are the real thing. Oh, and did I mention that the entire play is written in rhymed verse? At first, the language seems unnecessarily ornate, like bad imitation Shakespeare, but the viewer quickly becomes accustomed to Maher’s arcane vocabulary and mannered diction. The actors make the dialogue seem surprisingly naturalistic; after a while you can only pick out the rhymes by listening closely. As for why the dialogue needs to be in verse to begin with, Maher supplies one justification in the course of the play itself, although the real reason seems to be the playwright’s enjoyment of a challenge. Earlier this year, Catastrophic produced Maher’s There is a Happiness That Morning Is, which was written in rhyming couplets. The Catastrophic Theatre’s production of The Pine is a world premiere, so inevitably there were kinks in the production that will be ironed out during subsequent stagings. The first half of the play dragged a bit, taking unnecessary tangents that threatened to stall the play’s momentum. And the humor was hit-and-miss. Some comedic bits worked brilliantly, like the character of Death, represented by an officious neighbor named Steve. The funniest lines went to Morris, the English knight, who appeared to have come straight from the set of Spamalot!, still wielding a trademark Monty Python style of humor. Other bits, like the giant green bellhop and Gordon’s friendship with a fly, quickly grew tiresome. Overall, The Pine is an ambitious comedy of ideas that fails as often as it succeeds, but nevertheless provides some of the wackiest, wildest moments in recent Houston theater. And that’s nothing to scoff at.